During the last 37 years he has been directly involved in providing consultancy services as both a private practice quantity surveyor and contracting surveyor, working on a wide range of project types such as major hospitals and other healthcare facilities, schools, housing developments, offices, factories and recreational buildings. In addition to traditional quantity surveying services Colin has experience as a project manager and also in programme management, business case preparation and risk management on a wide range of project types. Over the last 20 years Colin has served his professional body the Royal Institution of Chartered Surveyors as Honorary Secretary for three years of the N.I. 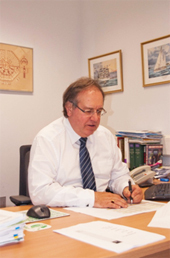 Quantity surveyors Division and its’ Chairman in 1993; Honorary Secretary for two years of the Royal Institution of Chartered Surveyors in N.I. and its’ Chairman in 2000. Since 2007 he has sat on the RICS World Governing Council which is the top decision making body of the RICS, setting the strategic direction for the organisation and is made up of a 70-strong Governing Council, chaired by the President, including RICS members from all world regions. Within the local construction industry Colin currently sits on the N.I. Professional College and is immediate Past-Chairman of the Council Industry Council for Northern Ireland and also is one of the CIGNI representatives on the Construction Industry Forum for Northern Ireland.